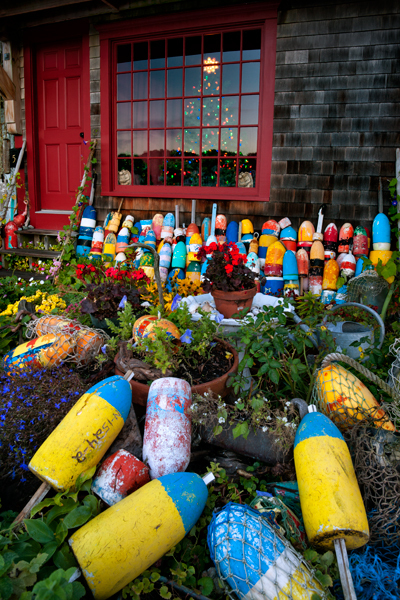 This home in Rockport Massachusetts beckoned me to capture its unique seacoast charm after I noticed the many old lobster buoys adorning the entrance. 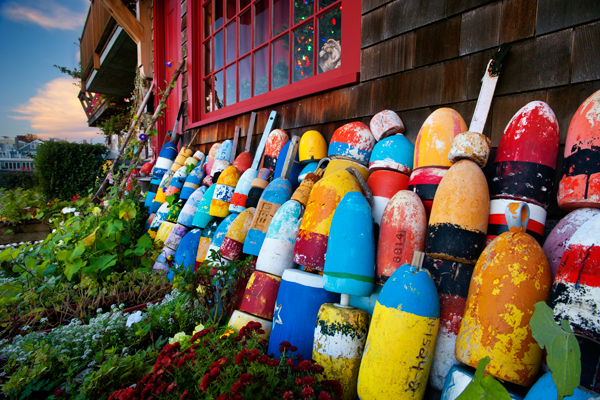 As I was speaking to the owners wife,she told me her husband had collected these authentic buoys along the shoreline years ago and this quaint scene had been featured in magazines more than once. I climbed down the ladder the fishermen use to access their boats to get this image in Rockport. 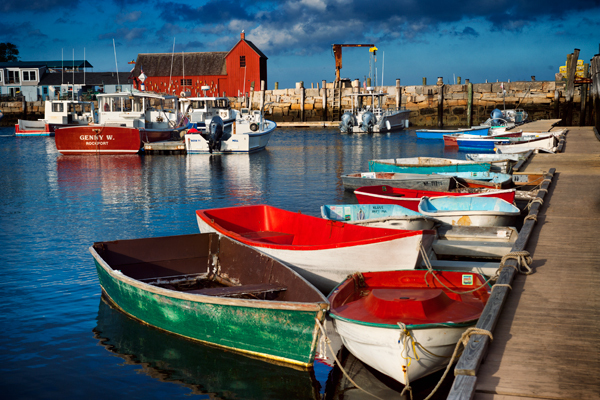 A wide array of colorful boats made for a nice composition. 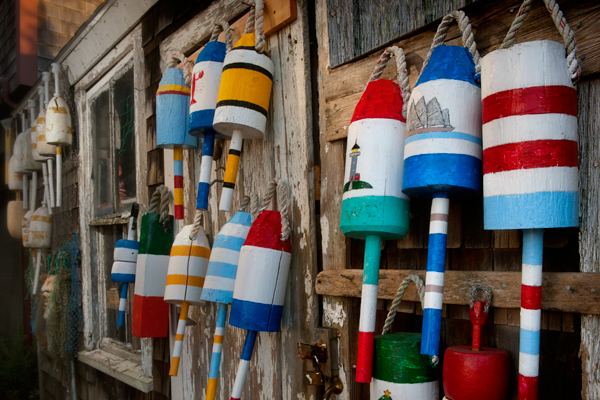 A New England fishing shack includes colorful hand painted buoys. 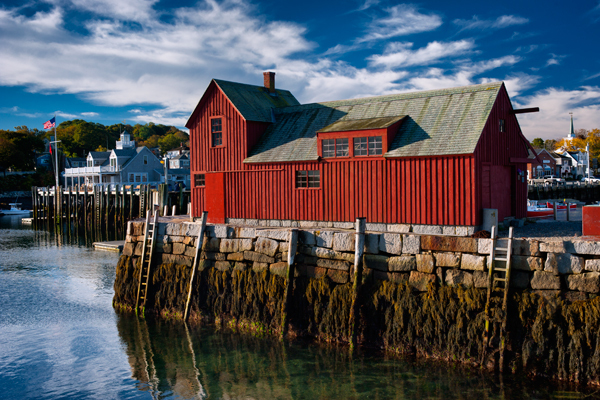 I photographed this lovely New England scene along the coast in Rockport Massachusetts. 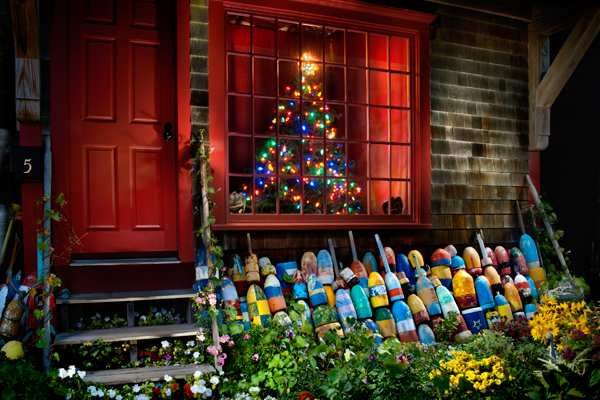 The Christmas tree in the window looks great above the collection of buoys outside and once evening came,I was able to paint the scene with a flashlight to bring it to life. The owners were very accommodating in allowing us to shoot it.The only way this might be better is if it was covered in fresh snow.. This famous building known as motif number one has been an inspiring subject for artists of all types for decades. I shot this reverse angle to catch the town church steeple in the background. If these buoys could talk,the stories they would tell would be amazing. 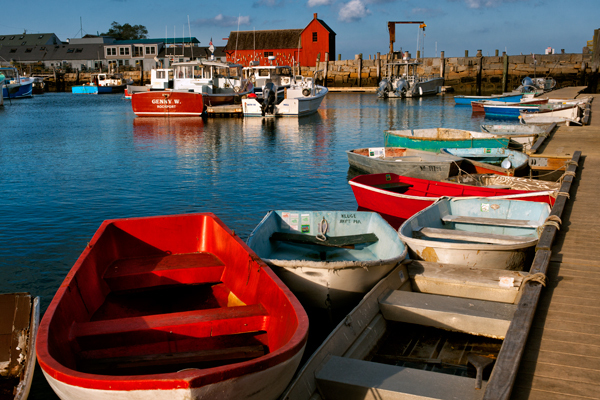 Rockport Massachusetts was one stop on my brief new england photo trip and shooting this classic scene was among my goals. I learned something new about this spot after hearing a term mentioned by three separate people in about an hours time. This place is referred to as motif number one,and is located on Bradley Wharf in the harbor town of Rockport, Massachusetts.It is a fishing shack well-known to students of art and art history as “the most often-painted building in America.” It is even listed on my atlas as motif one,which surprised me. It s very interesting to watch the fisherman stand in these little boats in the foreground to paddle out to their fishing boats in the morning. Super storm Sandy undermined one wall at the harbor but they escaped with much less damage than most. Our motel owner said the water came up to the ice machine there and the motel sits about 40 feet or more above the ocean and they stayed for the whole storm.